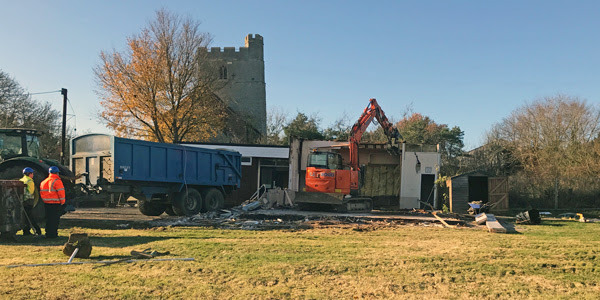 The Peldon Village Hall situated next to St Mary’s Church in Church Road, Peldon, is no more – watch this space for updates on the development of the new replacement hall. When this happens we expect, once again, to host events and meetings for the use of community groups and private individuals from within the Parish and beyond. The Bowls Club, Art Group, PAWS & others have used the Hall on a regular basis. It was also the venue for the Peldon May Festival and the Peldon Players stage their pantomime there every January. The Management Committee also runs a number of events during the year, including the ever-popular Quiz Nights. Please refer to the Events Calendar on the home page for further details. All of these have temporary alternate accommodation until the new build is complete. The Hall is available for hire and you can book it by calling Mrs Chris Moore on 01206 735228. Click on the links if you want to review the terms and conditions or download a booking form. Year ending 31st March 2010. The Management Committee has embarked on a project to replace the present hall with a new building, some 50% larger than the present one. Several events that are held in the Hall would benefit from a larger building. Because the Hall was built in the 1960s it does not meet current standards and we expect it to become increasingly expensive to maintain as it ages. In 2010 & 2011 Colchester Borough Council and Essex County Council awarded the Management Committee grants totalling £30,000 under the Communities Initiative Fund towards the preliminary costs of the project. In order to complete the project we expect to need to raise some £500,000. The committee appointed architects to assist and plans are now complete and consultation with the village undertaken. Taking that consultation into account we have submitted an application for planning permission for the new building. The designs that have been submitted can be found by following this link. The post PC Minutes – 9th April 2019 appeared first on Winstred Hundred Parish Council. The post PC Agenda 9th April 2019 appeared first on Winstred Hundred Parish Council. The post PAWS AGM 2019 appeared first on Winstred Hundred Parish Council. The post PC Minutes – 12th March 2019 appeared first on Winstred Hundred Parish Council. The post PC Agenda 12th March 2019 appeared first on Winstred Hundred Parish Council. The post Holidays – From Paris to Orkney appeared first on Winstred Hundred Parish Council. The post PC Minutes 12th February 2019 appeared first on Winstred Hundred Parish Council. The post PC Agenda 12th February 2019 appeared first on Winstred Hundred Parish Council. The post Plunkett Community Shops appeared first on Winstred Hundred Parish Council. The post The World of Optical Illusion appeared first on Winstred Hundred Parish Council.